The variety of creative art-oriented products on Etsy continues to amaze me. Tired of a plain, unadorned toilet? 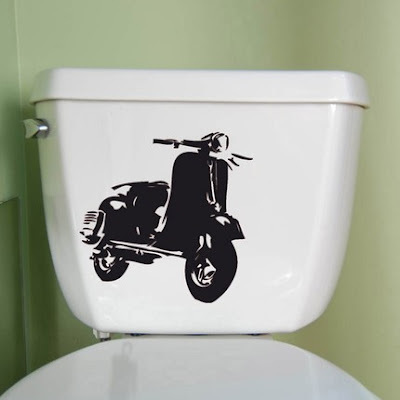 Try dressing it up with this decal. 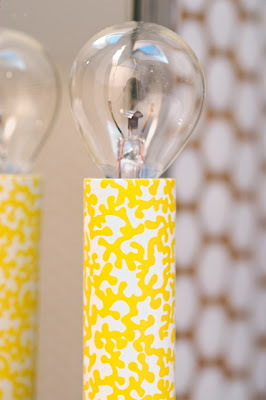 It might look great in a kids' bathroom or anywhere you need a little graphic punch. What do you think? Too much? Too weird? Nice touch? These two double matted and framed prints are back in my shop now! OK, lately I have been in the midst of that dreaded mid-winter task of sorting out paperwork, finances and taxes. Up to my ears in receipts and figures. Fun, right? Maybe so - there's hope! 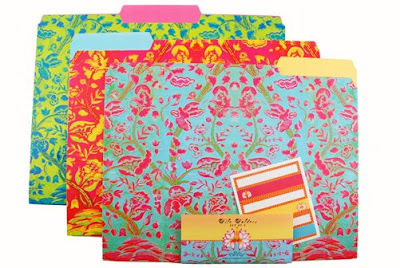 I saw these gorgeous file folders from Papaya and the mere sight of them could drive a girl to savor even the most tedious forms of paperwork organization. 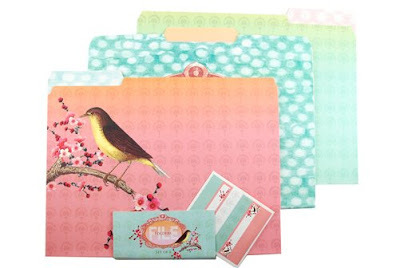 Along with these folders, there is also a gorgeous assortment of prints and papergoods sure to bring a touch of Spring to your workspace, no matter how dreary it might be. The colors are brilliant - literally!! Hey you know I gotta like 'em - I'm peddling for the competition! I want to thank my lovely friend Irene for her kind post and mention on my work Tuesday. Irene authors a design blog based in Greece and is currently doing a dedicatory retrospective series on her love for Domino. I wasn't even aware that there had been a Greek version of Domino in publication! 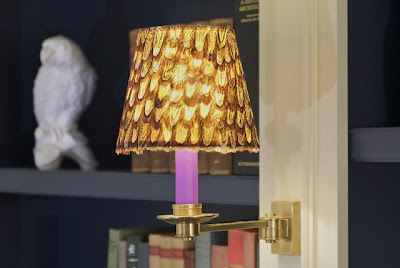 If you get a chance, please visit her blog, Happy Turtle Decor. 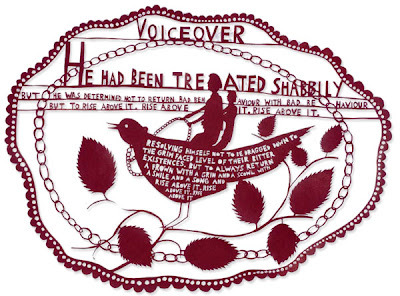 This is my favorite of his pieces - "He had been treated shabbily, but he was determined not to return bad behavior with bad behavior, but to rise above it. Rise above it. Rise above it. Resolving himself not to be dragged down to the grim faced level of their bitter existences. But to always return a frown with a grin and a scowl with a smile and a song and rise above it. Rise above it. Rise above it!" Wow - a great deal of wisdom in this message and an especially apropos reminder considering some individuals I've run across lately. Karma does happen, people. My dear grandmother would have loved these, as she was a huge fan of silhouettes and her entire bathroom was decorated with them. Hmmm, do they have Google Reader in heaven? This is so simple and beautiful - "You're in my head". 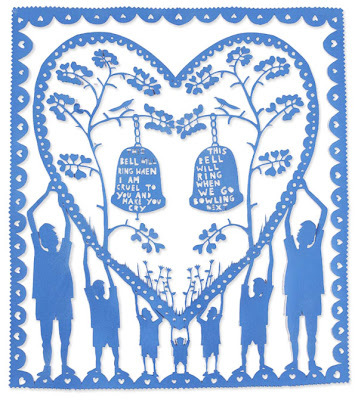 Offbeat humor that makes you smile - "This bell will ring when I am cruel to you and make you cry - this bell will ring when we go bowling next"
This is the amazingly phenomenal work of Scissor Master - Artist Rob Ryan . I have admired his work since I first saw it a couple of years ago. He has shown his genius craft worldwide, has published a book and also sells his work via Etsy. Just look at the detail and intricacy - not to mention the wisdom and the dry, British humor. 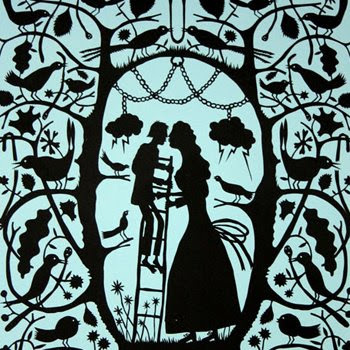 Having worked extensively with scissors myself (and suffered many a case of "scissorcramp"), I have quite an admiration for someone who has taken his scissor craft to a whole new level and elevated the skill of cutting to fine art. The best part is that his wit is equally as sharp as the scissors he uses to express it. Check out his blog here. Many thanks to everyone who entered my Valentine's give-away and added themselves to my "Followers" list! You are all valued and appreciated greatly! The lucky winner was chosen randomly via computer. 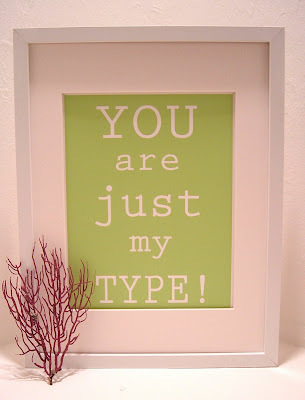 I am happy to congratulate "Karena" who has won the "You're Just My Type" print and her choice of a notecard set. 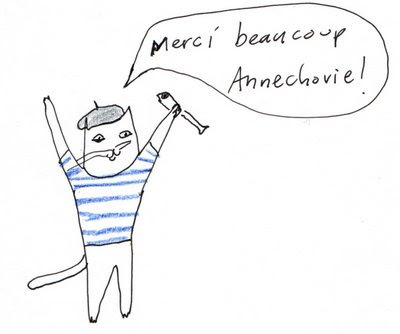 Here is another beautiful piece from my French friend Pascale. 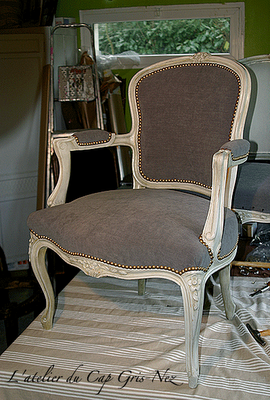 She is quite a talented artisan and elevates the profession of upholsterer to an entirely new level. 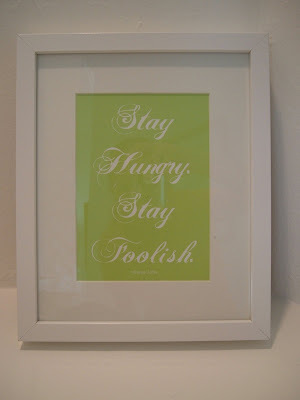 If you haven't been to her blog yet, please take a moment to check out her masterpieces here. Love the aqua with the white! Have you seen these yet? Talk about a great invention! A simple concept, yet a stroke of brilliance. 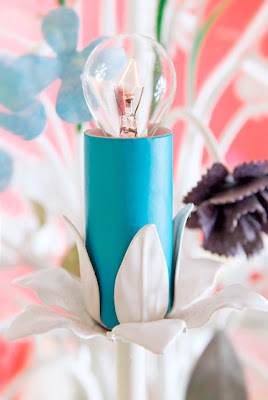 April Pride Allison, a talented Seattle-based product designer, came up with these ingenious paper sleeves in a wide variety of colors and prints to add pizazz to your lighting and cover those bland white-ish trunks. 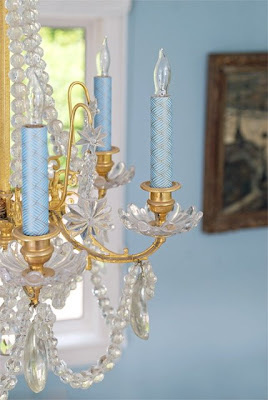 Got an outdated brass chandelier that's as dull as oatmeal? Spray paint it and get your hands on some of these kaarsKoker sleeves! Better yet, buy several sets and switch them out seasonally. At such an affordable price, ($12-23 USD) there's no excuse for dulls-ville anymore! See many more styles here. A very Happy Valentine's Day to all of my wonderful friends, readers and clients! I SO appreciate each and every one of you! 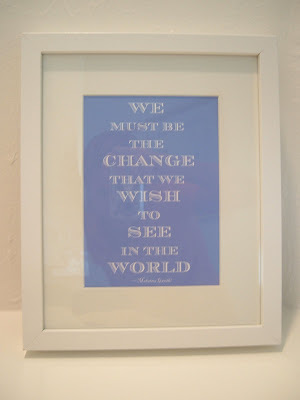 In honor of my readers, I am giving away one free quote print (above - frame not included) and set of notecards (of your choice) to the winner drawn randomly on Wednesday, February 18th. In order to enter, just leave a comment on this post and become a "FOLLOWER" in the sidebar. If you are already a follower, just leave a comment letting me know. I hope that you all have a wonderful Valentine's day tomorrow and a terrific weekend - see you Monday! 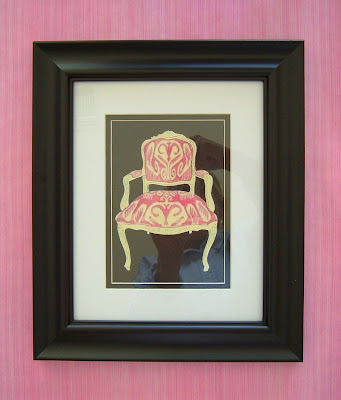 Small framed versions of both the Ikat Chair and Courtney Barnes Chair, here double-matted in new beveled style black frame. Other prints are available also, feel free to ask me if you have a custom combination in mind. 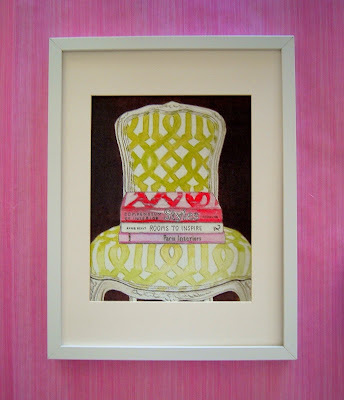 Now available, the LARGE Courtney Barnes Chair print framed in white here. THANK YOU FOR THE WARM FUZZIES, LADIES! This has nothing to do with art or design, BUT I couldn't resist posting this photo my sister sent me. 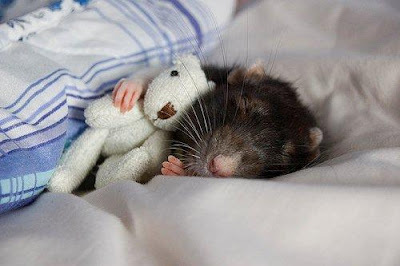 Just goes to prove that even a RAT can be styled to be appealing. I have been a bit remiss in expressing my gratitude, but better late then never, right? I want to thank a few very kind bloggers who have written very kind mentions on my work recently, Kara at The Steel Magnolia House, Melissa at the Preppy Apron , Beth at Style Redux and Lindsay at Lou Lou in Lilly. Thank you very much, ladies - you made my day and your support means so much! If I have missed anyone, please let me know. 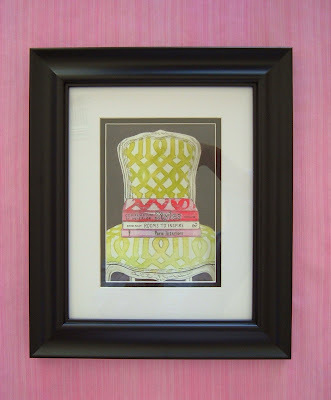 By request, I have now added the Courtney Barnes Chair design to my scalloped note card line. 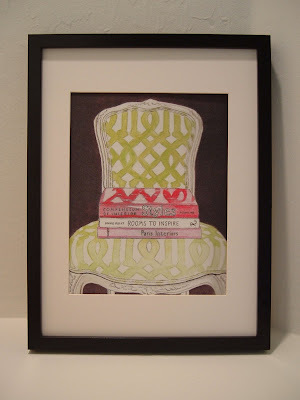 Also, the Courtney Barnes Chair, is now available in a larger size frame than has been previously available.This is printed on heavyweight quality acid-free watercolor paper (9x12 inches), with an ACID-FREE mat and a black frame measuring 11.75 x 15.75 inches (or 30x40 cm). The quality of the paper makes the print look amazingly like the original! Signed and dated by artist. Both new additions are available here at my Etsy shop. The march issue of Domino - the last issue. 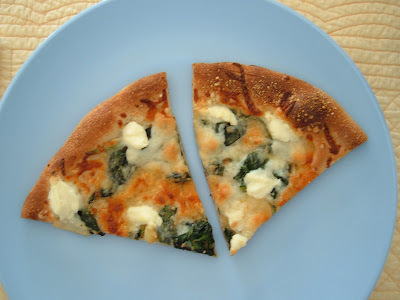 I just wanted to thank Katie Mulinix, a talented writer, who featured a guest post by me last week on her blog We LOVE Domino. 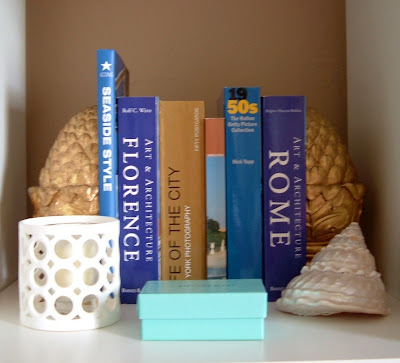 Katie is a former Apartment Therapy blogger and created We Love Domino. She wanted to bring together readers and admirers from the blog community and beyond to show support and re-live our favorite features, photos and inspirations from the now (sadly) defunct interiors and style guide. 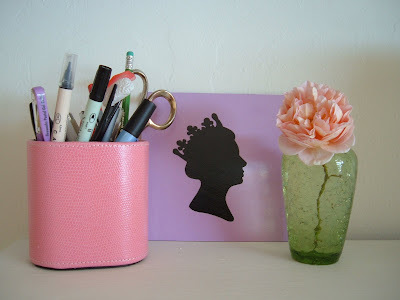 She is featuring posts by many of your favorite design bloggers, so be sure and check it out. Thanks, Kate! Some of my "odds and ends"
Do you ever just look around at some things that you live with and think, "I like THAT!" Not necessarily anything new, expensive or exceptional, but just something pretty, helpful or enriching to your life in some way? 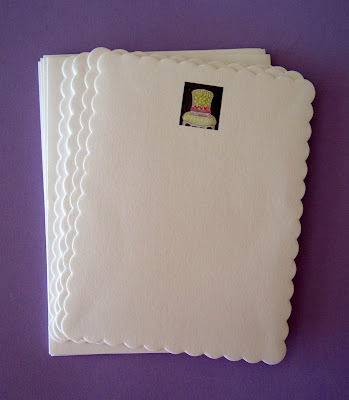 Something that's been given to you by someone you love or connected to a special memory? 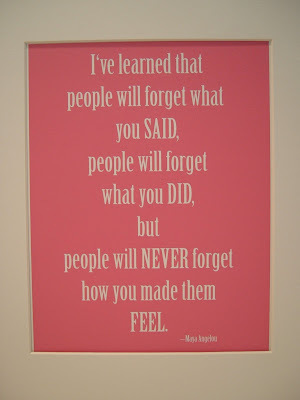 Is it me or did that just sound like Mr. Rogers? What about things that make your life a little easier or make you laugh to yourself when you see them? 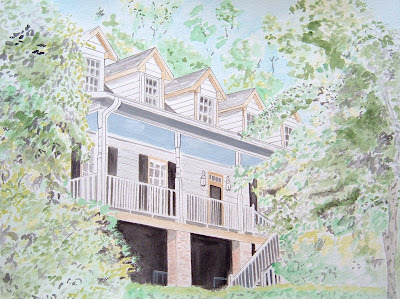 This is a commissioned piece I recently completed of a raised Southern cottage style home in Atlanta. The huge covered front porch is partially obstructed in this view by all of the trees surrounding it. The porch ceiling is painted blue and it looks like a great place to sit and have an iced tea in the Spring. I am always game to capture your favorite place in a painting! Please let me know if you're interested in a portrait of your home. Or a beanbag! 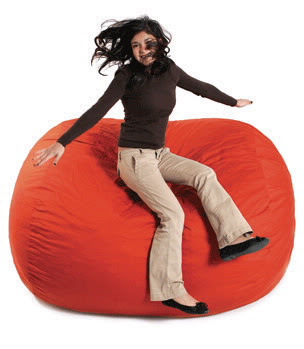 In the past, beanbag chairs have carried a stigma - something reserved for the college student or bachelor. Not anymore - they are becoming a must-have, especially for people with media rooms and kids. They have evolved into something cool and practical, and especially in this economy, a cost-effective alternative for extra seating. With events like Holidays, the Super Bowl and the Oscars come large gatherings and parties. 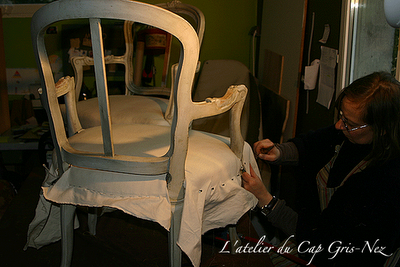 These events cause people to think about how to redecorate their homes to comfortably accommodate more people. However, one of the most comfortable furniture options is often overlooked. Bean bag chairs are very easy to setup… just toss it in the corner. They're also very easy to maintain. Many come with waterproof liners, so they're easy to clean. And with the internet, it's easy to find discount bean bag chairs at a great price. Many online stores even offer free shipping and long-term warranties. Kids bean bag chairs are great for bonus rooms, kid's rooms, and even living rooms. Children love these huge, oversized seats. So, next time you are thinking about adding to your furniture décor, consider adding a unique bean bag chair. Special thanks to my friend, fellow artist and blogger, Jamie Shelman, for her kind mention yesterday on her delightful blog, Small Expectations. 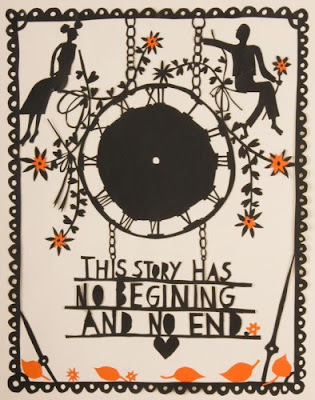 She is a witty artist living on Martha's Vineyard with her illustrator husband. She's also a very nice person (which is something that is WAY too underated, btw) and created this illustration for me last week - which I totally loved. Thank you, Jamie! This is very cool - I read that one of my favorite bloggers, Victoria Smith of SF Girl By Bay, rented out her cheery and stylish digs in San Francisco for a Boden photoshoot. Her home is in the background (above). What a great partnership! Hip, cool, and cheery are adjectives that aptly describe Victoria, her apartment, blog and Boden's clothing. I thought these shoes were a punchy and unexpected combo - very fun! 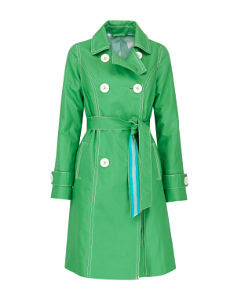 This green trench coat did catch my eye - not that I would wear it often here in the Sunshine State. Classic, yet certainly not boring. 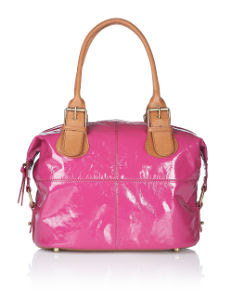 I thought this bag was perfect! So, if you haven't had a chance to check out Boden yet for their Spring line, I suggest you take a gander. I like their attitude and they put a different spin on things, including offering incentives for recommending them to your friends. As for SF Girl By Bay - a perennial favorite with me and a great way to banish the winter doldrums! Hope you have a Happy Monday!